From February through September 2015, NOAA Ship Okeanos Explorer embarked on a journey to investigate and document the Caribbean and the Hawaiian Islands. A combination of scientists, technicians, and engineers – both on board the ship and on shore – mapped and explored the geological, biological, archaeological, and chemical features of these vast areas. NOAA is interested in identifying scientists and managers wanting to actively participate during some or all of the 2015 expeditions. For details on opportunities to get involved, please visited this page. If you are interested in these opportunities, please contact Brian Kennedy for the Caribbean expedition or Kelley Elliott for the Pacific Monuments and sanctuaries project. Camera sled Seirios encounters a school of squid while ROV Deep Discoverer investigates deepwater habitats off the Atlantic Coast. 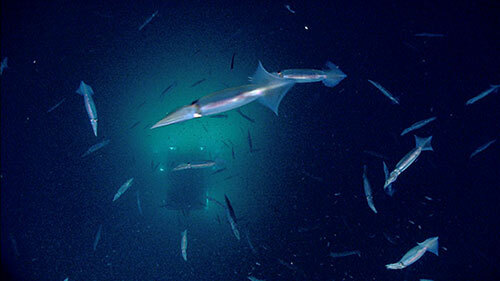 Image courtesy of NOAA Okeanos Explorer Program. Download image (jpg, 27 KB). During this series of cruises, Okeanos Explorer will focus on the diversity and distribution of deepwater habitats in Caribbean trenches and seamounts. We expect considerable time will be dedicated to the Puerto Rico Trench, where we will test the Deep Discoverer remotely operated vehicle (ROV) down to 6,000 meters. Pending discussions with our interagency, academic, and international partners, we are also likely to include targets in the Mona Passage and seamounts south of Puerto Rico. The expeditions are being designed to complement previous work in the region including 2014 explorations by E/V Nautilus . 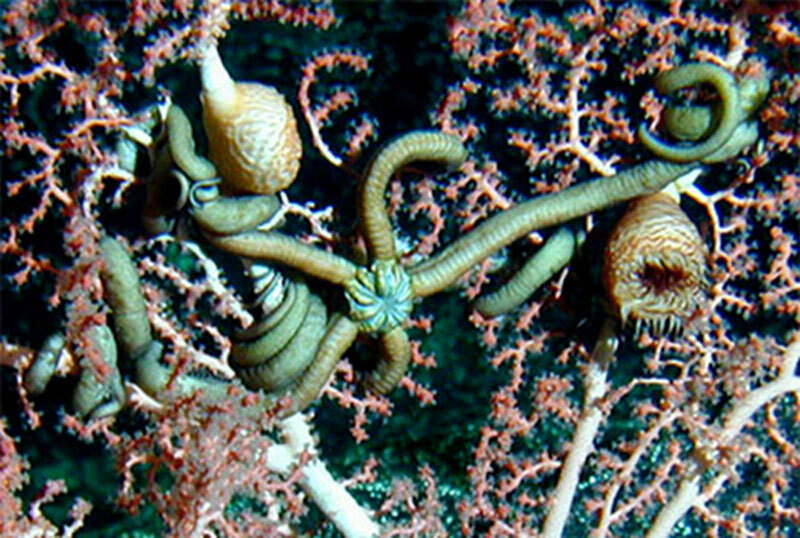 Scientists imaged this brittle star and several large anemones on a deep coral colony during an expedition to the Hawaiian Archipelago in 2004. Image courtesy of Amy Baco-Taylor, Thomas Shirley, pilots T. Kerby and M. Cremer, and NOAA. Download image (jpg, 150 KB). Beginning in July 2015, a team of NOAA and external partners will initiate the Campaign to Address Pacific monument Science, Technology, and Ocean NEeds (CAPSTONE). The Campaign will focus on systematically collecting baseline information to support science and management needs within and around the U.S. Marine National Monuments and other protected places in the Pacific. It also serves as an opportunity for NOAA and the nation to highlight the uniqueness and importance of these national symbols of ocean conservation. Field activities in 2015 will include work in and around the Papahānaumokuākea Marine National Monument, Hawaiian Islands Humpback Whale National Marine Sanctuary, and Johnston Atoll – part of the recently expanded Pacific Remote Islands Marine National Monument. Operations are being designed to complement previous field work in the area, including Schmidt Ocean Institute’s 2014 mapping expeditions in Papahānaumokuākea Marine National Monument .